Sugar cookies are great. 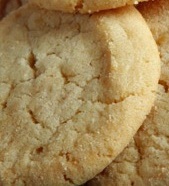 This is a very easy to make simple sugar cookie recipe. Try adding some macedamia nuts for some extra flavor.